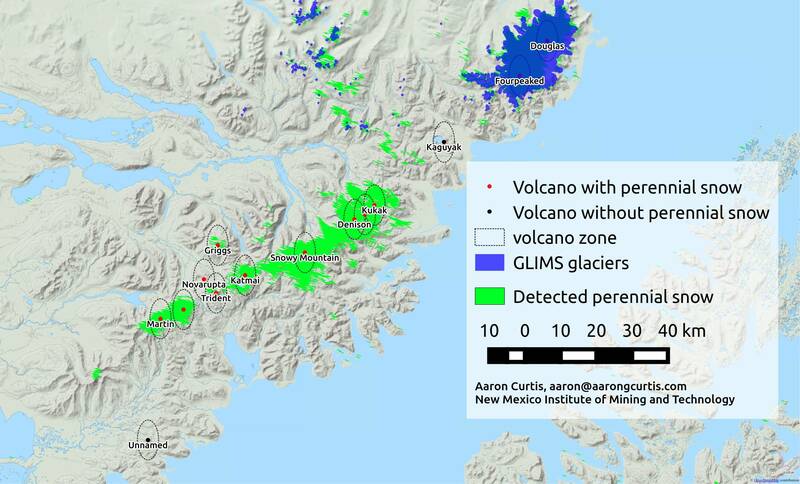 What percent of volcanoes are glaciated? I have not been able to find an estimate of how many known volcanoes host perennial ice masses, and it would be very useful to me. Does anyone know of any attempts to do this? 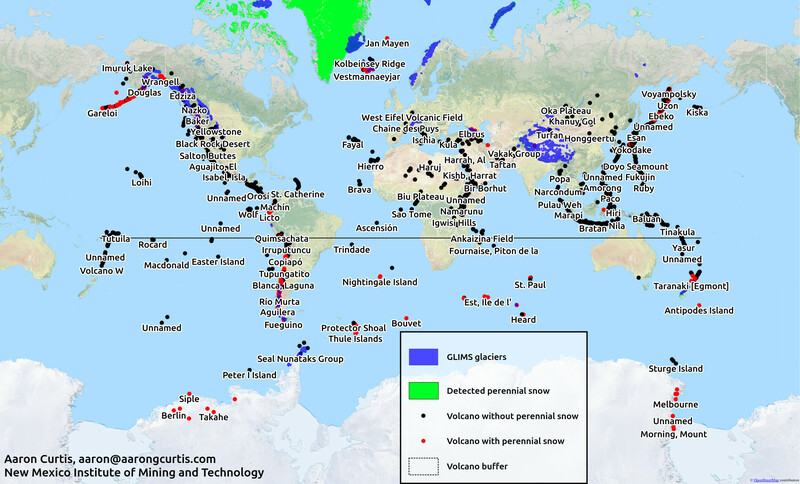 21.7%, by my calculations (338 / 1556 holocene-active volcanoes). I calculated perennial snow by combining 6 weeks of MOD10A2 data from winter and summer weeks in 2014 to figure out which pixels had snow both in the summer and the winter. My source code for that is available as a gist (an older version accidentally classified cloud as snow; that's been fixed). Then I checked if these pixels fell within 10km of the volcanoes in the Smithsonian Institution's Global Volcanism Database. I also plotted the woefully incomplete Global Land Ice Measurements from Space glacier polygons. There are clearly a few false-positives on ocean islands... I think this is due to MOD10A2 marking choppy surf as snow. Looking into that. I intend to publish this and will put a reference here if it is published. Not the answer you're looking for? Browse other questions tagged volcanology geography glaciology or ask your own question. Any other fumarolic ice caves in the literature? How strong can a glacial icequake get? How can I find the nearest point on the coast from an ocean location? Are volcanoes formed from earthquakes? How to cite LandSat 8? Can human activity affect volcanoes? Was there once a glacier over Starcke national park in Queensland Australia? Why do human populations concentrate near fault lines, volcanoes, etc.? What is the distance between the tropics?